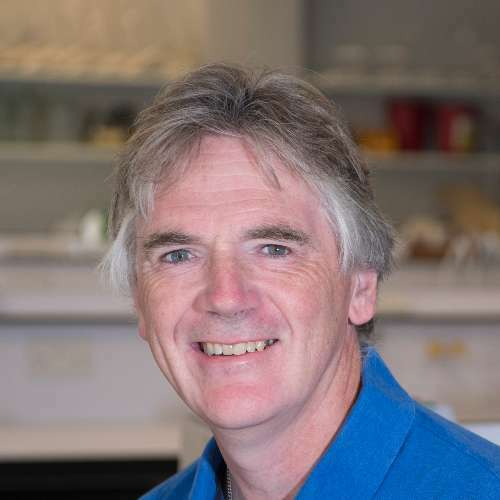 Professor Martin Warren joined the School of Biosciences in 2005. He is a member of the Industrial Biotechnology and Synthetic Biology Group and the Centre for Molecular Processing. Martin was born in Northern Ireland, brought up in County Down, and went to Portora Royal School, Enniskillen. He subsequently went to Southampton University where he read Biochemistry as an undergraduate (1981-1984). He stayed on in the Biochemistry Department to do a PhD with Professor Peter Shoolingin-Jordan, which initiated his interest in the genetics and biochemistry of tetrapyrrole biosynthesis. After completing his PhD studies, he moved in 1989 to Texas A & M University, where he worked as a research associated with Professor Ian Scott FRS on vitamin B12 biosynthesis. In 1991 he took up a lecturing position in the School of Biological Sciences at Queen Mary, University of London, where he stayed until 1995 when he moved to a Senior Lecturer position at the Institute of Ophthalmology, Univeristy College London. He was promoted to Reader of Biochemistry in 1998 but then moved back to the School of Biological Sciences at Queen Mary in 1999 to take up a Personal Chair. In 2005 he moved to the University of Kent, where he is Professor of Biochemistry. In 2007 he was awarded a BBSRC Professorial Fellowship to work on the bioengineering of complex metabolic pathways. He has published numerous articles on tetrapyrrole biosynthesis and the biochemistry underlying inherited retinopathies, as well as co-authoring a popular book on the link between tetrapyrrole biosynthesis and the madness of George III. Warren’s research envelops areas of chemistry, biology and history. His interests are firmly embedded in the biosynthesis and biology of the pigments of life, encompassing molecules such as heme, chlorophyll, vitamin B12, siroheme, coenzyme F430 and heme d1. With Dr Evelyne Deery he was one of the first to use synthetic biology as a means to probe biosynthetic pathways through the reconstruction of the whole cobalamin (vitamin B12) pathway in E. coli, an organism that does not possess the ability to make this molecule de novo. More recently he has elucidated a novel alternative heme biosynthesis pathway that is present in both archaea and sulphate reducing bacteria, where siroheme is hijacked as a substrate – a rare example of where one prosthetic group is cannibalised for the synthesis of another. His interest in vitamin B12 chemistry led to a study of how cobalamin is used for propanediol utilisation (pdu) in some bacteria, where remarkably the metabolic process is sequestered within a proteinaceous organelle called a bacterial micrcompartment, one of the largest protein-based complexes found in nature. Here, again, the entire pdu operon was cloned into E. coli and shown to orchestrate the construction of functional recombinant pdu microcompartments. Subsequently, empty organelles have been engineered through the targeting of new proteins and processes to these bodies. His interest in heme metabolism has also contributed to a new subject of scientific historiography. Here, he has studied George III, America’s last king, whose madness has been attributed to attacks of porphyria, an inborn error of heme metabolism. Through research in the Royal Archives in Windsor Castle and DNA analysis of some of the King’s descendants, coupled with a forensic analysis of the King’s hair, he has shown that it is likely that the much-maligned monarch suffered with variegate porphyria, worsened by the administration of antimony-based medication that was contaminated with arsenic. Showing 50 of 95 total publications in the Kent Academic Repository. View all publications. Osman, D. et al. (2019). Bacterial sensors define intracellular free energies for correct enzyme metalation. Nature Chemical Biology [Online] 15:241-249. Available at: https://doi.org/10.1038/s41589-018-0211-4. There is a challenge for metalloenzymes to acquire their correct metals because some inorganic elements form more stable complexes with proteins than do others. These preferences can be overcome provided some metals are more available than others. However, while the total amount of cellular metal can be readily measured, the available levels of each metal have been more difficult to define. Metal-sensing transcriptional regulators are tuned to the intracellular availabilities of their cognate ions. Here we have determined the standard free energy for metal complex formation to which each sensor, in a set of bacterial metal sensors, is attuned: The less competitive the metal, the less favourable the free energy and hence greater availability to which the cognate allosteric mechanism is tuned. Comparing these free energies with values derived from the metal affinities of a metalloprotein reveals the mechanism of correct metalation exemplified here by a cobalt-chelatase for vitamin B12. Videira, M. et al. (2018). Staphylococcus aureus haem biosynthesis and acquisition pathways are linked through haem monooxygenase IsdG. Molecular Microbiology [Online] 109:385-400. Available at: https://doi.org/10.1111/mmi.14060. Haem is an essential cofactor in central metabolic pathways in the vast majority of living systems. Prokaryotes acquire haem via haem biosynthesis pathways, and some also utilize haem uptake systems, yet it remains unclear how they balance haem requirements with the paradox that free haem is toxic. Here, using the model pathogen Staphylococcus aureus, we report that IsdG, one of two haem oxygenase enzymes in the haem uptake system, inhibits the formation of haem via the internal haem biosynthesis route. More specifically, we show that IsdG decreases the activity of ferrochelatase and that the two proteins interact both in vitro and in vivo. Further, a bioinformatics analysis reveals that a significant number of haem biosynthesis pathway containing organisms possess an IsdG?homologue and that those with both biosynthesis and uptake systems have at least two haem oxygenases. We conclude that IsdG?like proteins control intracellular haem levels by coupling the two pathways. IsdG is thus a target for the treatment of S. aureusinfections. Lee, M., Palmer, D. and Warren, M. (2018). Biotechnological advances in bacterial microcompartment technology. Trends in Biotechnology [Online]. Available at: https://doi.org/10.1016/j.tibtech.2018.08.006. providing both enhanced flux and protection against toxic intermediates. engineering of biological systems for useful purposes. Lawrence, A. et al. (2018). Construction of Fluorescent Analogs to Follow the Uptake and Distribution of Cobalamin (Vitamin B 12 ) in Bacteria, Worms, and Plants. Cell Chemical Biology [Online]. Available at: https://doi.org/10.1016/j.chembiol.2018.04.012. sativum are also able to transport B12. Uddin, I. et al. (2018). A Generic Self-Assembly Process in Microcompartments and Synthetic Protein Nanotubes. Small [Online] 14:1704020. Available at: https://doi.org/10.1002/smll.201704020. Bacterial microcompartments enclose a biochemical pathway and reactive intermediate within a protein envelope formed by the shell proteins. Herein, the orientation of the propanediol?utilization (Pdu) microcompartment shell protein PduA in bacterial microcompartments and in synthetic nanotubes, and the orientation of PduB in synthetic nanotubes are revealed. When produced individually, PduA hexamers and PduB trimers, tessellate to form flat sheets in the crystal, or they can self?assemble to form synthetic protein nanotubes in solution. Modelling the orientation of PduA in the 20 nm nanotube so as to preserve the shape complementarity and key interactions seen in the crystal structure suggests that the concave surface of the PduA hexamer faces out. This orientation is confirmed experimentally in synthetic nanotubes and in the bacterial microcompartment produced in vivo. The PduB nanotubes described here have a larger diameter, 63 nm, with the concave surface of the trimer again facing out. The conserved concave surface out characteristic of these nano?structures reveals a generic assembly process that causes the interface between adjacent subunits to bend in a common direction that optimizes shape complementarity and minimizes steric clashes. This understanding underpins engineering strategies for the biotechnological application of protein nanotubes. Lee, M. et al. (2018). De novo targeting to the cytoplasmic and luminal side of bacterial microcompartments. Nature Communications [Online] 9:3413. Available at: https://doi.org/10.1038/s41467-018-05922-x. Huber, I. et al. (2017). Construction of Recombinant Pdu Metabolosome Shells for Small Molecule Production in Corynebacterium glutamicum. ACS Synthetic Biology [Online] 6:2145-2156. Available at: http://dx.doi.org/10.1021/acssynbio.7b00167. Bacterial microcompartments have significant potential in the area of industrial biotechnology for the production of small molecules, especially involving metabolic pathways with toxic or volatile intermediates. Corynebacterium glutamicum is an established industrial workhorse for the production of amino acids and has been investigated for the production of diamines, dicarboxylic acids, polymers and biobased fuels. Herein, we describe components for the establishment of bacterial microcompartments as production chambers in C. glutamicum. Within this study, we optimized genetic clusters for the expression of the shell components of the Citrobacter freundii propanediol utilization (Pdu) bacterial compartment, thereby facilitating heterologous compartment production in C. glutamicum. Upon induction, transmission electron microscopy images of thin sections from these strains revealed microcompartment-like structures within the cytosol. Furthermore, we demonstrate that it is possible to target eYFP to the empty microcompartments through C-terminal fusions with synthetic scaffold interaction partners (PDZ, SH3 and GBD) as well as with a non-native C-terminal targeting peptide from AdhDH (Klebsiella pneumonia). Thus, we show that it is possible to target proteins to compartments where N-terminal targeting is not possible. The overproduction of PduA alone leads to the construction of filamentous structures within the cytosol and eYFP molecules are localized to these structures when they are N-terminally fused to the P18 and D18 encapsulation peptides from PduP and PduD, respectively. In the future, these nanotube-like structures might be used as scaffolds for directed cellular organization and pathway enhancement. Dailey, H. et al. (2017). Prokaryotic Heme Biosynthesis: Multiple Pathways to a Common Essential Product. Microbiology and Molecular Biology Reviews [Online] 81:e00048-16. Available at: https://doi.org/10.1128/MMBR.00048-16. The advent of heme during evolution allowed organisms possessing this compound to safely and efficiently carry out a variety of chemical reactions that otherwise were difficult or impossible. While it was long assumed that a single heme biosynthetic pathway existed in nature, over the past decade, it has become clear that there are three distinct pathways among prokaryotes, although all three pathways utilize a common initial core of three enzymes to produce the intermediate uroporphyrinogen III. The most ancient pathway and the only one found in the Archaea converts siroheme to protoheme via an oxygen-independent four-enzyme-step process. Bacteria utilize the initial core pathway but then add one additional common step to produce coproporphyrinogen III. Following this step, Gram-positive organisms oxidize coproporphyrinogen III to coproporphyrin III, insert iron to make coproheme, and finally decarboxylate coproheme to protoheme, whereas Gram-negative bacteria first decarboxylate coproporphyrinogen III to protoporphyrinogen IX and then oxidize this to protoporphyrin IX prior to metal insertion to make protoheme. In order to adapt to oxygen-deficient conditions, two steps in the bacterial pathways have multiple forms to accommodate oxidative reactions in an anaerobic environment. The regulation of these pathways reflects the diversity of bacterial metabolism. This diversity, along with the late recognition that three pathways exist, has significantly slowed advances in this field such that no single organism's heme synthesis pathway regulation is currently completely characterized. Liang, M. et al. (2017). Bacterial microcompartment-directed polyphosphate kinase promotes stable polyphosphate accumulation in E. coli. Biotechnology Journal [Online] 12:1600415. Available at: http://doi.org/10.1002/biot.201600415. Processes for the biological removal of phosphate from wastewater rely on temporary manipulation of bacterial polyphosphate levels by phased environmental stimuli. In E. coli polyphosphate levels are controlled via the polyphosphate-synthesizing enzyme polyphosphate kinase (PPK1) and exopolyphosphatases (PPX and GPPA), and are temporarily enhanced by PPK1 overexpression and reduced by PPX overexpression. We hypothesised that partitioning PPK1 from cytoplasmic exopolyphosphatases would increase and stabilise E. coli polyphosphate levels. Partitioning was achieved by co-expression of E. coli PPK1 fused with a microcompartment-targeting sequence and an artificial operon of Citrobacter freundii bacterial microcompartment genes. Encapsulation of targeted PPK1 resulted in persistent phosphate uptake and stably increased cellular polyphosphate levels throughout cell growth and into the stationary phase, while PPK1 overexpression alone produced temporary polyphosphate increase and phosphate uptake. Targeted PPK1 increased polyphosphate in microcompartments 8-fold compared with non-targeted PPK1. Co-expression of PPX polyphosphatase with targeted PPK1 had little effect on elevated cellular polyphosphate levels because microcompartments retained polyphosphate. Co-expression of PPX with non-targeted PPK1 reduced cellular polyphosphate levels. Thus, subcellular compartmentalisation of a polymerising enzyme sequesters metabolic products from competing catabolism by preventing catabolic enzyme access. Specific application of this process to polyphosphate is of potential application for biological phosphate removal. Lee, M. et al. (2017). Engineered synthetic scaffolds for organizing proteins within the bacterial cytoplasm. Nature Chemical Biology [Online] 14:142-147. Available at: https://doi.org/10.1038/nchembio.2535. We have developed a system for producing a supramolecular scaffold that permeates the entire Escherichia coli cytoplasm. This cytoscaffold is constructed from a three-component system comprising a bacterial microcompartment shell protein and two complementary de novo coiled-coil peptides. We show that other proteins can be targeted to this intracellular filamentous arrangement. Specifically, the enzymes pyruvate decarboxylase and alcohol dehydrogenase have been directed to the filaments, leading to enhanced ethanol production in these engineered bacterial cells compared to those that do not produce the scaffold. This is consistent with improved metabolic efficiency through enzyme colocation. Finally, the shell-protein scaffold can be directed to the inner membrane of the cell, demonstrating how synthetic cellular organization can be coupled with spatial optimization through in-cell protein design. The cytoscaffold has potential in the development of next-generation cell factories, wherein it could be used to organize enzyme pathways and metabolite transporters to enhance metabolic flux. Moore, S. et al. (2017). Elucidation of the biosynthesis of the methane catalyst coenzyme F430. Nature [Online]:78-82. Available at: http://dx.doi.org/10.1038/nature21427. Methane biogenesis in methanogens is mediated by methyl-coenzyme M reductase, an enzyme that is also responsible for the utilization of methane through anaerobic methane oxidation. The enzyme uses an ancillary factor called coenzyme F430, a nickel-containing modified tetrapyrrole that promotes catalysis through a methyl radical/Ni(II)-thiolate intermediate. However, it is unclear how coenzyme F430 is synthesized from the common primogenitor uroporphyrinogen III, incorporating 11 steric centres into the macrocycle, although the pathway must involve chelation, amidation, macrocyclic ring reduction, lactamization and carbocyclic ring formation. Here we identify the proteins that catalyse the biosynthesis of coenzyme F430 from sirohydrochlorin, termed CfbA–CfbE, and demonstrate their activity. The research completes our understanding of how the repertoire of tetrapyrrole-based pigments are constructed, permitting the development of recombinant systems to use these metalloprosthetic groups more widely. Bag, S. et al. (2016). Classification of polyhedral shapes from individual anisotropically resolved cryo-electron tomography reconstructions. BMC Bioinformatics [Online] 17:234-247. Available at: http://doi.org/10.1186/s12859-016-1107-5. Cryo-electron tomography (cryo-ET) enables 3D imaging of macromolecular structures. Reconstructed cryo-ET images have a “missing wedge” of data loss due to limitations in rotation of the mounting stage. Most current approaches for structure determination improve cryo-ET resolution either by some form of sub-tomogram averaging or template matching, respectively precluding detection of shapes that vary across objects or are a priori unknown. Various macromolecular structures possess polyhedral structure. We propose a classification method for polyhedral shapes from incomplete individual cryo-ET reconstructions, based on topological features of an extracted polyhedral graph (PG). We outline a pipeline for extracting PG from 3-D cryo-ET reconstructions. For classification, we construct a reference library of regular polyhedra. Using geometric simulation, we construct a non-parametric estimate of the distribution of possible incomplete PGs. In studies with simulated data, a Bayes classifier constructed using these distributions has an average test set misclassification error of?<?5 % with upto 30 % of the object missing, suggesting accurate polyhedral shape classification is possible from individual incomplete cryo-ET reconstructions. We also demonstrate how the method can be made robust to mis-specification of the PG using an SVM based classifier. The methodology is applied to cryo-ET reconstructions of 30 micro-compartments isolated from E. coli bacteria. The predicted shapes aren’t unique, but all belong to the non-symmetric Johnson solid family, illustrating the potential of this approach to study variation in polyhedral macromolecular structures. Mayer, M. et al. (2016). Effect of bio-engineering on size, shape, composition and rigidity of bacterial microcompartments. Scientific Reports [Online] 6:36899. Available at: http://dx.doi.org/10.1038/srep36899. Helliwell, K. et al. (2016). Cyanobacteria and Eukaryotic Algae Use Different Chemical Variants of Vitamin B12. Current biology : CB [Online] 26:999-1008. Available at: http://doi.org/10.1016/j.cub.2016.02.041. Eukaryotic microalgae and prokaryotic cyanobacteria are the major components of the phytoplankton. Determining factors that govern growth of these primary producers, and how they interact, is therefore essential to understanding aquatic ecosystem productivity. Over half of microalgal species representing marine and freshwater habitats require for growth the corrinoid cofactor B12, which is synthesized de novo only by certain prokaryotes, including the majority of cyanobacteria. There are several chemical variants of B12, which are not necessarily functionally interchangeable. Cobalamin, the form bioavailable to humans, has as its lower axial ligand 5,6-dimethylbenzimidazole (DMB). Here, we show that the abundant marine cyanobacterium Synechococcus synthesizes only pseudocobalamin, in which the lower axial ligand is adenine. Moreover, bioinformatic searches of over 100 sequenced cyanobacterial genomes for B12 biosynthesis genes, including those involved in nucleotide loop assembly, suggest this is the form synthesized by cyanobacteria more broadly. We further demonstrate that pseudocobalamin is several orders of magnitude less bioavailable than cobalamin to several B12-dependent microalgae representing diverse lineages. This indicates that the two major phytoplankton groups use a different B12 currency. However, in an intriguing twist, some microalgal species can use pseudocobalamin if DMB is provided, suggesting that they are able to remodel the cofactor, whereas Synechococcus cannot. This species-specific attribute implicates algal remodelers as novel and keystone players of the B12 cycle, transforming our perception of the dynamics and complexity of the flux of this nutrient in aquatic ecosystems. Lee, M. et al. (2016). Employing bacterial microcompartment technology to engineer a shell-free enzyme-aggregate for enhanced 1,2-propanediol production in Escherichia coli. Metabolic Engineering [Online] 36:48-56. Available at: http://doi.org/10.1016/j.ymben.2016.02.007. Bacterial microcompartments (BMCs) enhance the breakdown of metabolites such as 1,2-propanediol (1,2-PD) to propionic acid. The encapsulation of proteins within the BMC is mediated by the presence of targeting sequences. In an attempt to redesign the Pdu BMC into a 1,2-PD synthesising factory using glycerol as the starting material we added N-terminal targeting peptides to glycerol dehydrogenase, dihydroxyacetone kinase, methylglyoxal synthase and 1,2-propanediol oxidoreductase to allow their inclusion into an empty BMC. 1,2-PD producing strains containing the fused enzymes exhibit a 245% increase in product formation in comparison to un-tagged enzymes, irrespective of the presence of BMCs. Tagging of enzymes with targeting peptides results in the formation of dense protein aggregates within the cell that are shown by immuno-labelling to contain the vast majority of tagged proteins. It can therefore be concluded that these protein inclusions are metabolically active and facilitate the significant increase in product formation. Widner, F. et al. (2016). Total Synthesis, Structure, and Biological Activity of Adenosylrhodibalamin, the Non-Natural Rhodium Homologue of Coenzyme B12. Angewandte Chemie International Edition [Online] 55:11281-11286. Available at: http://doi.org/10.1002/anie.201603738. Lobo, S. et al. (2015). Staphylococcus aureus haem biosynthesis: characterisation of the enzymes involved in final steps of the pathway. Molecular Microbiology [Online] 97:472-487. Available at: http://doi.org/10.1111/mmi.13041. Haem is a life supporting molecule that is ubiquitous in all major kingdoms. In Staphylococcus aureus, the importance of haem is highlighted by the presence of systems both for the exogenous acquisition and endogenous synthesis of this prosthetic group. In this work, we show that in S.?aureus the formation of haem involves the conversion of coproporphyrinogen III into coproporphyrin III by coproporphyrin synthase HemY, insertion of iron into coproporphyrin III via ferrochelatase HemH, and oxidative decarboxylation of Fe-coproporphyrin III into protohaem IX by Fe-coproporphyrin oxidase/dehydrogenase HemQ. Together, this route represents a transitional pathway between the classic pathway and the more recently acknowledged alternative biosynthesis machinery. The role of the haem biosynthetic pathway in the survival of the bacterium was investigated by testing for inhibitors of HemY. Analogues of acifluorfen are shown to inhibit the flavin-containing HemY, highlighting this protein as a suitable target for the development of drugs against S.?aureus. Moreover, the presence of a transitional pathway for haem biosynthesis within many Gram positive pathogenic bacteria suggests that this route has the potential not only for the design of antimicrobials but also for the selective discrimination between bacteria operating different routes to the biosynthesis of haem. Gu, S. et al. (2015). Crystal structure of CobK reveals strand-swapping between Rossmann-fold domains and molecular basis of the reduced precorrin product trap. Scientific Reports [Online] 5:16943-16952. Available at: http://doi.org/10.1038/srep16943. CobK catalyzes the essential reduction of the precorrin ring in the cobalamin biosynthetic pathway. The crystal structure of CobK reveals that the enzyme, despite not having the signature sequence, comprises two Rossmann fold domains which bind coenzyme and substrate respectively. The two parallel ?-sheets have swapped their last ?-strands giving a novel sheet topology which is an interesting variation on the Rossmann-fold. The trapped ternary complex with coenzyme and product reveals five conserved basic residues that bind the carboxylates of the tetrapyrrole tightly anchoring the product. A loop, disordered in both the apoenzyme and holoenzyme structures, closes around the product further tightening binding. The structure is consistent with a mechanism involving protonation of C18 and pro-R hydride transfer from NADPH to C19 of precorrin-6A and reveals the interactions responsible for the specificity of CobK. The almost complete burial of the reduced precorrin product suggests a remarkable form of metabolite channeling where the next enzyme in the biosynthetic pathway triggers product release. Bali, S. et al. (2014). Recent advances in the biosynthesis of modified tetrapyrroles: the discovery of an alternative pathway for the formation of heme and heme d 1. Cellular and Molecular Life Sciences [Online] 71:2837-2863. Available at: http://dx.doi.org/10.1007/s00018-014-1563-x. Hemes (a, b, c, and o) and heme d 1 belong to the group of modified tetrapyrroles, which also includes chlorophylls, cobalamins, coenzyme F430, and siroheme. These compounds are found throughout all domains of life and are involved in a variety of essential biological processes ranging from photosynthesis to methanogenesis. The biosynthesis of heme b has been well studied in many organisms, but in sulfate-reducing bacteria and archaea, the pathway has remained a mystery, as many of the enzymes involved in these characterized steps are absent. The heme pathway in most organisms proceeds from the cyclic precursor of all modified tetrapyrroles uroporphyrinogen III, to coproporphyrinogen III, which is followed by oxidation of the ring and finally iron insertion. Sulfate-reducing bacteria and some archaea lack the genetic information necessary to convert uroporphyrinogen III to heme along the “classical” route and instead use an “alternative” pathway. Biosynthesis of the isobacteriochlorin heme d 1, a cofactor of the dissimilatory nitrite reductase cytochrome cd 1, has also been a subject of much research, although the biosynthetic pathway and its intermediates have evaded discovery for quite some time. This review focuses on the recent advances in the understanding of these two pathways and their surprisingly close relationship via the unlikely intermediate siroheme, which is also a cofactor of sulfite and nitrite reductases in many organisms. The evolutionary questions raised by this discovery will also be discussed along with the potential regulation required by organisms with overlapping tetrapyrrole biosynthesis pathways. Lawrence, A. et al. (2014). Solution Structure of a Bacterial Microcompartment Targeting Peptide and Its Application in the Construction of an Ethanol Bioreactor. ACS Synthetic Biology [Online] 3:454-465. Available at: http://dx.doi.org/10.1021/sb4001118. Targeting of proteins to bacterial microcompartments (BMCs) is mediated by an 18-amino-acid peptide sequence. Herein, we report the solution structure of the N-terminal targeting peptide (P18) of PduP, the aldehyde dehydrogenase associated with the 1,2-propanediol utilization metabolosome from Citrobacter freundii. The solution structure reveals the peptide to have a well-defined helical conformation along its whole length. Saturation transfer difference and transferred NOE NMR has highlighted the observed interaction surface on the peptide with its main interacting shell protein, PduK. By tagging both a pyruvate decarboxylase and an alcohol dehydrogenase with targeting peptides, it has been possible to direct these enzymes to empty BMCs in vivo and to generate an ethanol bioreactor. Not only are the purified, redesigned BMCs able to transform pyruvate into ethanol efficiently, but the strains containing the modified BMCs produce elevated levels of alcohol. Pang, A. et al. (2014). Structural Insights into Higher Order Assembly and Function of the Bacterial Microcompartment Protein PduA. Journal of Biological Chemistry [Online] 289:22377-22384. Available at: http://dx.doi.org/10.1074/jbc.M114.569285. Bacterial microcompartments are large proteinaceous assemblies that are found in the cytoplasm of some bacteria. These structures consist of proteins constituting a shell that houses a number of enzymes involved in specific metabolic processes. The 1,2-propanediol-utilizing microcompartment is assembled from seven different types of shell proteins, one of which is PduA. It is one of the more abundant components of the shell and intriguingly can form nanotubule-like structures when expressed on its own in the cytoplasm of Escherichia coli. We propose a model that accounts for the size and appearance of these PduA structures and underpin our model using a combinatorial approach. Making strategic mutations at Lys-26, Val-51, and Arg-79, we targeted residues predicted to be important for PduA assembly. We present the effect of the amino acid residue substitution on the phenotype of the PduA higher order assemblies (transmission electron microscopy) and the crystal structure of the K26D mutant with one glycerol molecule bound to the central pore. Our results support the view that the hexamer-hexamer interactions seen in PduA crystals persist in the cytoplasmic structures and reveal the profound influence of the two key amino acids, Lys-26 and Arg-79, on tiling, not only in the crystal lattice but also in the bacterial cytoplasm. Understanding and controlling PduA assemblies is valuable in order to inform manipulation for synthetic biology and biotechnological applications. Lobo, S. et al. (2014). Characterisation of Desulfovibrio vulgaris haem b synthase, a radical SAM family member. Biochimica et Biophysica Acta (BBA) - Proteins and Proteomics [Online] 1844:1238-1247. Available at: http://dx.doi.org/10.1016/j.bbapap.2014.03.016. An alternative route for haem b biosynthesis is operative in sulfate-reducing bacteria of the Desulfovibrio genus and in methanogenic Archaea. This pathway diverges from the canonical one at the level of uroporphyrinogen III and progresses via a distinct branch, where sirohaem acts as an intermediate precursor being converted into haem b by a set of novel enzymes, named the alternative haem biosynthetic proteins (Ahb). In this work, we report the biochemical characterisation of the Desulfovibrio vulgaris AhbD enzyme that catalyses the last step of the pathway. Mass spectrometry analysis showed that AhbD promotes the cleavage of S-adenosylmethionine (SAM) and converts iron-coproporphyrin III via two oxidative decarboxylations to yield haem b, methionine and the 5?-deoxyadenosyl radical. Electron paramagnetic resonance spectroscopy studies demonstrated that AhbD contains two [4Fe–4S]2 +/1 + centres and that binding of the substrates S-adenosylmethionine and iron-coproporphyrin III induces conformational modifications in both centres. Amino acid sequence comparisons indicated that D. vulgaris AhbD belongs to the radical SAM protein superfamily, with a GGE-like motif and two cysteine-rich sequences typical for ligation of SAM molecules and iron-sulfur clusters, respectively. A structural model of D. vulgaris AhbD with putative binding pockets for the iron-sulfur centres and the substrates SAM and iron-coproporphyrin III is discussed. Moore, S. et al. (2014). Towards a cell factory for vitamin B12 production in Bacillus megaterium: bypassing of the cobalamin riboswitch control elements. New Biotechnology [Online] 31:553-561. Available at: http://dx.doi.org/10.1016/j.nbt.2014.03.003. Bacillus megaterium is a bacterium that has been used in the past for the industrial production of vitamin B12 (cobalamin), the anti-pernicious anaemia factor. Cobalamin is a modified tetrapyrrole with a cobalt ion coordinated within its macrocycle. More recently, B. megaterium has been developed as a host for the high-yield production of recombinant proteins using a xylose inducible promoter system. Herein, we revisit cobalamin production in B. megaterium DSM319. We have investigated the importance of cobalt for optimum growth and cobalamin production. The cobaltochelatase (CbiXL) is encoded within a 14-gene cobalamin biosynthetic (cbi) operon, whose gene-products oversee the transformation of uroporphyrinogen III into adenosylcobyrinic acid a,c-diamide, a key precursor of cobalamin synthesis. The production of CbiXL in response to exogenous cobalt was monitored. The metal was found to stimulate cobalamin biosynthesis and decrease the levels of CbiXL. From this we were able to show that the entire cbi operon is transcriptionally regulated by a B12-riboswitch, with a switch-off point at approximately 5 nM cobalamin. To bypass the effects of the B12-riboswitch the cbi operon was cloned without these regulatory elements. Growth of these strains on minimal media supplemented with glycerol as a carbon source resulted in significant increases in cobalamin production (up to 200 ?g L?1). In addition, a range of partially amidated intermediates up to adenosylcobyric acid was detected. These findings outline a potential way to develop B. megaterium as a cell factory for cobalamin production using cheap raw materials. Palmer, D. et al. (2014). The structure, function and properties of sirohaem decarboxylase - an enzyme with structural homology to a transcription factor family that is part of the alternative haem biosynthesis pathway. Molecular Microbiology [Online] 93:247-261. Available at: http://dx.doi.org/10.1111/mmi.12656. Bali, S. et al. (2014). Identification and characterization of the ‘missing’ terminal enzyme for siroheme biosynthesis in ?-proteobacteria. Molecular Microbiology [Online] 92:153-163. Available at: http://dx.doi.org/10.1111/mmi.12542. It has recently been shown that the biosynthetic route for both the d1-haem cofactor of dissimilatory cd1 nitrite reductases and haem, via the novel alternative-haem-synthesis pathway, involves siroheme as an intermediate, which was previously thought to occur only as a cofactor in assimilatory sulphite/nitrite reductases. In many denitrifiers (which require d1-haem), the pathway to make siroheme remained to be identified. Here we identify and characterize a sirohydrochlorin–ferrochelatase from Paracoccus pantotrophus that catalyses the last step of siroheme synthesis. It is encoded by a gene annotated as cbiX that was previously assumed to be encoding a cobaltochelatase, acting on sirohydrochlorin. Expressing this chelatase from a plasmid restored the wild-type phenotype of an Escherichia coli mutant-strain lacking sirohydrochlorin–ferrochelatase activity, showing that this chelatase can act in the in vivo siroheme synthesis. A ?cbiX mutant in P.?denitrificans was unable to respire anaerobically on nitrate, proving the role of siroheme as a precursor to another cofactor. We report the 1.9?Å crystal structure of this ferrochelatase. In vivo analysis of single amino acid variants of this chelatase suggests that two histidines, His127 and His187, are essential for siroheme synthesis. This CbiX can generally be identified in ?-proteobacteria as the terminal enzyme of siroheme biosynthesis. Lawrence, A. et al. (2014). FAD binding, cobinamide binding and active site communication in the corrin reductase (CobR). Bioscience Reports [Online] 34:345-355. Available at: http://dx.doi.org/10.1042/BSR20140060. Adenosylcobalamin, the coenzyme form of vitamin B12, is one Nature's most complex coenzyme whose de novo biogenesis proceeds along either an anaerobic or aerobic metabolic pathway. The aerobic synthesis involves reduction of the centrally chelated cobalt metal ion of the corrin ring from Co(II) to Co(I) before adenosylation can take place. A corrin reductase (CobR) enzyme has been identified as the likely agent to catalyse this reduction of the metal ion. Herein, we reveal how Brucella melitensis CobR binds its coenzyme FAD (flavin dinucleotide) and we also show that the enzyme can bind a corrin substrate consistent with its role in reduction of the cobalt of the corrin ring. Stopped-flow kinetics and EPR reveal a mechanistic asymmetry in CobR dimer that provides a potential link between the two electron reduction by NADH to the single electron reduction of Co(II) to Co(I). Moore, S. et al. (2013). Characterization of the enzyme CbiH60 involved in anaerobic ring contraction of the cobalamin (vitamin B12) biosynthetic pathway. Journal of Biological Chemistry [Online] 288:297-305. Available at: http://dx.doi.org/10.1074/jbc.M112.422535. The anaerobic pathway for the biosynthesis of cobalamin (vitamin B(12)) has remained poorly characterized because of the sensitivity of the pathway intermediates to oxygen and the low activity of enzymes. One of the major bottlenecks in the anaerobic pathway is the ring contraction step, which has not been observed previously with a purified enzyme system. The Gram-positive aerobic bacterium Bacillus megaterium has a complete anaerobic pathway that contains an unusual ring contraction enzyme, CbiH(60), that harbors a C-terminal extension with sequence similarity to the nitrite/sulfite reductase family. To improve solubility, the enzyme was homologously produced in the host B. megaterium DSM319. CbiH(60) was characterized by electron paramagnetic resonance and shown to contain a [4Fe-4S] center. Assays with purified recombinant CbiH(60) demonstrate that the enzyme converts both cobalt-precorrin-3 and cobalt factor III into the ring-contracted product cobalt-precorrin-4 in high yields, with the latter transformation dependent upon DTT and an intact Fe-S center. Furthermore, the ring contraction process was shown not to involve a change in the oxidation state of the central cobalt ion of the macrocycle. Collins, H. et al. (2013). Bacillus megaterium has both a functional BluB protein required for DMB synthesis and a related flavoprotein that forms a stable radical species. PLoS ONE [Online] 8:e55708. Available at: http://dx.doi.org/10.1371/journal.pone.0055708. Despite the extensive study of the biosynthesis of the complex molecule B12 (cobalamin), the mechanism by which the lower ligand 5,6-dimethylbenzimidazole (DMB) is formed has remained something of a mystery. However, recent work has identified and characterized a DMB-synthase (BluB) responsible for the oxygen-dependent, single enzyme conversion of FMN to DMB. In this work, we have identified BluB homologs from the aerobic purple, nonsulfur, photosynthetic bacterium Rhodobacter capsulatus and the aerobic soil bacterium Bacillus megaterium and have demonstrated DMB synthesis by the use of a novel complementation assay in which a B12 deficient strain, substituted with the precursor cobinamide is recovered either by the addition of DMB or by the recombinant expression of a bluB gene. The DMB-synthetic activity of the purified recombinant BluB enzymes was further confirmed in vitro by providing the enzyme with FMNH2 and oxygen and observing the formation of DMB by HPLC. The formation of a 4a-peroxyflavin intermediate, the first step in the oxygen dependent mechanism of DMB biosynthesis, is reported here and is the first intermediate in the enzyme catalysed reaction to be demonstrated experimentally to date. The identification and characterization of an FMN-binding protein found on the cobI operon of B. megaterium, CbiY, is also detailed, revealing an FMN-containing enzyme which is able to stabilize a blue flavin semiquinone upon reduction with a 1-electron donor. Azim, N. et al. (2013). Crystallization and preliminary X-ray characterization of the tetrapyrrole-biosynthetic enzyme porphobilinogen deaminase from Bacillus megaterium. Acta Crystallographica Section F Structural Biology and Crystallization Communications [Online] 69:906-908. Available at: http://dx.doi.org/10.1107/S1744309113018526. The enzyme porphobilinogen deaminase (PBGD; hydroxymethylbilane synthase; EC 2.5.1.61) catalyses an early step of the tetrapyrrole-biosynthesis pathway in which four molecules of the monopyrrole porphobilinogen are condensed to form a linear tetrapyrrole. The enzyme possesses a dipyrromethane cofactor which is covalently linked by a thioether bridge to an invariant cysteine residue. Expression in Escherichia coli of a His-tagged form of Bacillus megaterium PBGD permitted the crystallization and preliminary X-ray analysis of the enzyme from this species at high resolution. Moore, S. et al. (2013). Elucidation of the anaerobic pathway for the corrin component of cobalamin (vitamin B12). Proceedings of the National Academy of Sciences [Online] 110:14906-14911. Available at: http://dx.doi.org/10.1073/pnas.1308098110. It has been known for the past 20 years that two pathways exist in nature for the de novo biosynthesis of the coenzyme form of vitamin B12, adenosylcobalamin, representing aerobic and anaerobic routes. In contrast to the aerobic pathway, the anaerobic route has remained enigmatic because many of its intermediates have proven technically challenging to isolate, because of their inherent instability. However, by studying the anaerobic cobalamin biosynthetic pathway in Bacillus megaterium and using homologously overproduced enzymes, it has been possible to isolate all of the intermediates between uroporphyrinogen III and cobyrinic acid. Consequently, it has been possible to detail the activities of purified cobinamide biosynthesis (Cbi) proteins CbiF, CbiG, CbiD, CbiJ, CbiET, and CbiC, as well as show the direct in vitro conversion of 5-aminolevulinic acid into cobyrinic acid using a mixture of 14 purified enzymes. This approach has resulted in the isolation of the long sought intermediates, cobalt-precorrin-6A and -6B and cobalt-precorrin-8. EPR, in particular, has proven an effective technique in following these transformations with the cobalt(II) paramagnetic electron in the dyz orbital, rather than the typical dz2. This result has allowed us to speculate that the metal ion plays an unexpected role in assisting the interconversion of pathway intermediates. By determining a function for all of the pathway enzymes, we complete the tool set for cobalamin biosynthesis and pave the way for not only enhancing cobalamin production, but also design of cobalamin derivatives through their combinatorial use and modification. Kazamia, E. et al. (2012). Mutualistic interactions between vitamin B12 -dependent algae and heterotrophic bacteria exhibit regulation. Environmental Microbiology [Online] 14:1466-1476. Available at: http://dx.doi.org/10.1111/j.1462-2920.2012.02733.x. Many algae are auxotrophs for vitamin B(12) (cobalamin), which they need as a cofactor for B(12) -dependent methionine synthase (METH). Because only prokaryotes can synthesize the cobalamin, they must be the ultimate source of the vitamin. In the laboratory, a direct interaction between algae and heterotrophic bacteria has been shown, with bacteria supplying cobalamin in exchange for fixed carbon. Here we establish a system to study this interaction at the molecular level. In a culture of a B(12) -dependent green alga Chlamydomonas nivalis, we found a contaminating bacterium, identified by 16S rRNA analysis as Mesorhizobium sp. Using the sequenced strain of M.?loti (MAFF303099), we found that it was able to support the growth of B(12) -dependent Lobomonas rostrata, another green alga, in return for fixed carbon. The two organisms form a stable equilibrium in terms of population numbers, which is maintained over many generations in semi-continuous culture, indicating a degree of regulation. However, addition of either vitamin B(12) or a carbon source for the bacteria perturbs the equilibrium, demonstrating that the symbiosis is mutualistic and facultative. Chlamydomonas reinhardtii does not require B(12) for growth because it encodes a B(12) -independent methionine synthase, METE, the gene for which is suppressed by addition of exogenous B(12) . Co-culturing C.?reinhardtii with M.?loti also results in reduction of METE expression, demonstrating that the bacterium can deliver the vitamin to this B(12) -independent alga. We discuss the implications of this for the widespread distribution of cobalamin auxotrophy in the algal kingdom. Saha, K. et al. (2012). Characterization of the evolutionarily conserved iron-sulfur cluster of sirohydrochlorin ferrochelatase from Arabidopsis thaliana. Biochemical Journal [Online] 444:227-237. Available at: http://dx.doi.org/10.1042/BJ20111993. Sirohaem is a cofactor of nitrite and sulfite reductases, essential for assimilation of nitrogen and sulfur. Sirohaem is synthesized from the central tetrapyrrole intermediate uroporphyrinogen III by methylation, oxidation and ferrochelation reactions. In Arabidopsis thaliana, the ferrochelation step is catalysed by sirohydrochlorin ferrochelatase (SirB), which, unlike its counterparts in bacteria, contains an [Fe-S] cluster. We determined the cluster to be a [4Fe-4S] type, which quickly oxidizes to a [2Fe-2S] form in the presence of oxygen. We also identified the cluster ligands as four conserved cysteine residues located at the C-terminus. A fifth conserved cysteine residue, Cys(135), is not involved in ligating the cluster directly, but influences the oxygen-sensitivity of the [4Fe-4S] form, and possibly the affinity for the substrate metal. Substitution mutants of the enzyme lacking the Fe-S cluster or Cys(135) retain the same specific activity in vitro and dimeric quaternary structure as the wild-type enzyme. The mutant variants also rescue a defined Escherichia coli sirohaem-deficient mutant. However, the mutant enzymes cannot complement Arabidopsis plants with a null AtSirB mutation, which exhibits post-germination arrest. These observations suggest an important physiological role for the Fe-S cluster in Planta, highlighting the close association of iron, sulfur and tetrapyrrole metabolism. Warman, A. et al. (2012). Characterization of Cupriavidus metallidurans CYP116B1- a thiocarbamate herbicide oxygenating P450-phthalate dioxygenase reductase fusion protein. FEBS Journal [Online] 279:1675-1693. Available at: http://dx.doi.org/10.1111/j.1742-4658.2012.08543.x. The novel cytochrome P450/redox partner fusion enzyme CYP116B1 from Cupriavidus?metallidurans was expressed in and purified from Escherichia coli. Isolated CYP116B1 exhibited a characteristic Fe(II)CO complex with Soret maximum at 449 nm. EPR and resonance Raman analyses indicated low-spin, cysteinate-coordinated ferric haem iron at both 10 K and ambient temperature, respectively, for oxidized CYP116B1. The EPR of reduced CYP116B1 demonstrated stoichiometric binding of a 2Fe-2S cluster in the reductase domain. FMN binding in the reductase domain was confirmed by flavin fluorescence studies. Steady-state reduction of cytochrome c and ferricyanide were supported by both NADPH/NADH, with NADPH used more efficiently (K(m[NADPH]) = 0.9 ± 0.5 ?M and K(m[NADH]) = 399.1 ± 52.1 ?M). Stopped-flow studies of NAD(P)H-dependent electron transfer to the reductase confirmed the preference for NADPH. The reduction potential of the P450 haem iron was -301 ± 7 mV, with retention of haem thiolate ligation in the ferrous enzyme. Redox potentials for the 2Fe-2S and FMN cofactors were more positive than that of the haem iron. Multi-angle laser light scattering demonstrated CYP116B1 to be monomeric. Type I (substrate-like) binding of selected unsaturated fatty acids (myristoleic, palmitoleic and arachidonic acids) was shown, but these substrates were not oxidized by CYP116B1. However, CYP116B1 catalysed hydroxylation (on propyl chains) of the herbicides S-ethyl dipropylthiocarbamate (EPTC) and S-propyl dipropylthiocarbamate (vernolate), and the subsequent N-dealkylation of vernolate. CYP116B1 thus has similar thiocarbamate-oxidizing catalytic properties to Rhodoccocus erythropolis CYP116A1, a P450 involved in the oxidative degradation of EPTC. Moore, S. and Warren, M. (2012). The anaerobic biosynthesis of vitamin B12. Biochemical Society Transactions [Online] 40:581-586. Available at: http://dx.doi.org/10.1042/BST20120066. Vitamin B12 (cobalamin) is a cobalt-containing modified tetrapyrrole that is an essential nutrient for higher animals. Its biosynthesis is restricted to certain bacteria and requires approximately 30 enzymatic steps for its complete de novo construction. Remarkably, two distinct biosynthetic pathways exist, which are termed the aerobic and anaerobic routes. The anaerobic pathway has yet to be fully characterized due to the inherent instability of its oxygen-sensitive intermediates. Bacillus megaterium, a bacterium previously used for the commercial production of cobalamin, has a complete anaerobic pathway and this organism is now being used to investigate the anaerobic B12 pathway through the application of recent advances in recombinant protein production. The present paper provides a summary of recent findings in the anaerobic pathway and future perspectives. Deery, E. et al. (2012). An enzyme-trap approach allows isolation of intermediates in cobalamin biosynthesis. Nature Chemical Biology [Online] 8:933-940. Available at: http://dx.doi.org/10.1038/nchembio.1086. Bali, S. et al. (2011). Molecular hijacking of siroheme for the synthesis of heme and d1 heme. Proceedings of the National Academy of Sciences of the United States of America [Online] 108:18260-18265. Available at: http://dx.doi.org/10.1073/pnas.1108228108. Modified tetrapyrroles such as chlorophyll, heme, siroheme, vitamin B12, coenzyme F430, and heme d1 underpin a wide range of essential biological functions in all domains of life, and it is therefore surprising that the syntheses of many of these life pigments remain poorly understood. It is known that the construction of the central molecular framework of modified tetrapyrroles is mediated via a common, core pathway. Herein a further branch of the modified tetrapyrrole biosynthesis pathway is described in denitrifying and sulfate-reducing bacteria as well as the Archaea. This process entails the hijacking of siroheme, the prosthetic group of sulfite and nitrite reductase, and its processing into heme and d1 heme. The initial step in these transformations involves the decarboxylation of siroheme to give didecarboxysiroheme. For d1 heme synthesis this intermediate has to undergo the replacement of two propionate side chains with oxygen functionalities and the introduction of a double bond into a further peripheral side chain. For heme synthesis didecarboxysiroheme is converted into Fe-coproporphyrin by oxidative loss of two acetic acid side chains. Fe-coproporphyrin is then transformed into heme by the oxidative decarboxylation of two propionate side chains. The mechanisms of these reactions are discussed and the evolutionary significance of another role for siroheme is examined. Pang, A., Warren, M. and Pickersgill, R. (2011). Structure of PduT, a trimeric bacterial microcompartment protein with a 4Fe–4S cluster-binding site. Acta Crystallographica Section D-Biological Crystallography [Online] 67:91-96. Available at: http://dx.doi.org/10.1107/S0907444910050201. Romao, C. et al. (2011). Evolution in a family of chelatases facilitated by the introduction of active site asymmetry and protein oligomerization. Proceedings of the National Academy of Sciences of the United States of America [Online] 108:97-102. Available at: http://dx.doi.org/10.1073/pnas.1014298108. The class II chelatases associated with heme, siroheme, and cobalamin biosynthesis are structurally related enzymes that insert a specific metal ion (Fe2+ or Co2+) into the center of a modified tetrapyrrole (protoporphyrin or sirohydrochlorin). The structures of two related class II enzymes, CbiXS from Archaeoglobus fulgidus and CbiK from Salmonella enterica, that are responsible for the insertion of cobalt along the cobalamin biosynthesis pathway are presented in complex with their metallated product. A further structure of a CbiK from Desulfovibrio vulgaris Hildenborough reveals how cobalt is bound at the active site. The crystal structures show that the binding of sirohydrochlorin is distinctly different to porphyrin binding in the protoporphyrin ferrochelatases and provide a molecular overview of the mechanism of chelation. The structures also give insights into the evolution of chelatase form and function. Finally, the structure of a periplasmic form of Desulfovibrio vulgaris Hildenborough CbiK reveals a novel tetrameric arrangement of its subunits that are stabilized by the presence of a heme b cofactor. Whereas retaining colbaltochelatase activity, this protein has acquired a central cavity with the potential to chaperone or transport metals across the periplasmic space, thereby evolving a new use for an ancient protein subunit. Hansson, M. et al. (2011). Bacterial ferrochelatase turns human: Tyr13 determines the apparent metal specificity of Bacillus subtilis ferrochelatase. JBIC Journal of Biological Inorganic Chemistry [Online] 16:235-242. Available at: http://dx.doi.org/10.1007/s00775-010-0720-4. Seyedarabi, A. et al. (2010). Cloning, purification and preliminary crystallographic analysis of cobalamin methyltransferases fromRhodobacter capsulatus. Acta Crystallographica Section F Structural Biology and Crystallization Communications [Online] 66:1652-1656. Available at: http://dx.doi.org/10.1107/S1744309110042910. Bali, S., Warren, M. and Ferguson, S. (2010). NirF is a periplasmic protein that binds d1 heme as part of its essential role in d1 heme biogenesis. FEBS Journal [Online] 277:4944-4955. Available at: http://dx.doi.org/10.1111/j.1742-4658.2010.07899.x. Storbeck, S. et al. (2010). A Novel Pathway for the Biosynthesis of Heme in Archaea: Genome-Based Bioinformatic Predictions and Experimental Evidence. Archaea [Online] 2010:1-15. Available at: http://dx.doi.org/10.1155/2010/175050. Heme is an essential prosthetic group for many proteins involved in fundamental biological processes in all three domains of life. In Eukaryota and Bacteria heme is formed via a conserved and well-studied biosynthetic pathway. Surprisingly, in Archaea heme biosynthesis proceeds via an alternative route which is poorly understood. In order to formulate a working hypothesis for this novel pathway, we searched 59 completely sequenced archaeal genomes for the presence of gene clusters consisting of established heme biosynthetic genes and colocalized conserved candidate genes. Within the majority of archaeal genomes it was possible to identify such heme biosynthesis gene clusters. From this analysis we have been able to identify several novel heme biosynthesis genes that are restricted to archaea. Intriguingly, several of the encoded proteins display similarity to enzymes involved in heme d1 biosynthesis. To initiate an experimental verification of our proposals two Methanosarcina barkeri proteins predicted to catalyze the initial steps of archaeal heme biosynthesis were recombinantly produced, purified, and their predicted enzymatic functions verified. Biedendieck, R. et al. (2010). Metabolic engineering of cobalamin (vitamin B12) production inBacillus megaterium. Microbial Biotechnology [Online] 3:24-37. Available at: http://dx.doi.org/10.1111/j.1751-7915.2009.00125.x. Brindley, A. et al. (2010). NirJ, a radical SAM family member of the d1 heme biogenesis cluster. FEBS Letters [Online] 584:2461-2466. Available at: http://dx.doi.org/10.1016/j.febslet.2010.04.053. Kerfeld, C. et al. (2010). Characterisation of PduS, the pdu Metabolosome Corrin Reductase, and Evidence of Substructural Organisation within the Bacterial Microcompartment. PLoS ONE [Online] 5:e14009. Available at: http://dx.doi.org/10.1371/journal.pone.0014009. Zajicek, R. et al. (2009). d1 haem biogenesis - assessing the roles of three nir gene products. FEBS Journal [Online] 276:6399-6411. Available at: http://dx.doi.org/10.1111/j.1742-4658.2009.07354.x. Lotierzo, M. et al. (2009). Iron–sulfur cluster dynamics in biotin synthase: A new [2Fe–2S]1+ cluster. Biochemical and Biophysical Research Communications [Online] 381:487-490. Available at: http://dx.doi.org/10.1016/j.bbrc.2009.02.089. Biotin synthase (BioB) catalyses the final step in the biosynthesis of biotin. Aerobically purified biotin synthase contains one [2Fe–2S]2+ cluster per monomer. However, active BioB contains in addition a [4Fe–4S]2+ cluster which can be formed either by reconstitution with iron and sulfide, or on reduction with sodium dithionite. Here, we use EPR spectroscopy to show that mutations in the conserved YNHNLD sequence of Escherichia coli BioB affect the formation and stability of the [4Fe–4S]1+ cluster on reduction with dithionite and report the observation of a new [2Fe–2S]1+ cluster. These results serve to illustrate the dynamic nature of iron–sulfur clusters in biotin synthase and the role played by the protein in cluster interconversion. Smith, A., Warren, M. and Refsum, H. (2018). Vitamin B 12. in: Eskin, N. A. M. ed. New Research and Developments of Water-Soluble Vitamins. Elsevier, pp. 215-279. Available at: https://doi.org/10.1016/bs.afnr.2017.11.005. The biosynthesis of B12, involving up to 30 different enzyme-mediated steps, only occurs in bacteria. Thus, most eukaryotes require an external source of B12, and yet the vitamin appears to have only two functions in eukaryotes: as a cofactor for the enzymes methionine synthase and methylmalonylCoA mutase. These two functions are crucial for normal health in humans, and in particular, the formation of methionine is essential for providing methyl groups for over 100 methylation processes. Interference with the methionine synthase reaction not only depletes the body of methyl groups but also leads to the accumulation of homocysteine, a risk factor for many diseases. The syndrome pernicious anemia, characterized by lack of intrinsic factor, leads to a severe, sometimes fatal form of B12 deficiency. However, there is no sharp cutoff for B12 deficiency; rather, there is a continuous inverse relationship between serum B12 and a variety of undesirable outcomes, including neural tube defects, stroke, and dementia. The brain is particularly vulnerable; in children, inadequate B12 stunts brain and intellectual development. Suboptimal B12 status (serum B12 < 300 pmol/L) is very common, occurring in 30%–60% of the population, in particular in pregnant women and in less-developed countries. Thus, many tens of millions of people in the world may suffer harm from having a poor B12 status. Public health steps are urgently needed to correct this inadequacy. Lobo, S., Warren, M. and Saraiva, L. (2012). Sulfate-reducing bacteria reveal a new branch of tetrapyrrole metabolism. in: Advances in Microbial Physiology. Elsevier Ltd, pp. 267-295. Available at: http://dx.doi.org/10.1016/B978-0-12-394423-8.00007-X. Sulfate-reducing microorganisms are a diverse group of bacteria and archaea that occupy important environmental niches and have potential for significant biotechnological impact. Desulfovibrio, the most studied genus among the sulfate-reducing microorganisms, contains proteins with a wide variety of tetrapyrrole-derived cofactors, including some unique derivatives such as uroporphyrin I and coproporphyrin III. Herein, we review tetrapyrrole metabolism in Desulfovibrio spp., including the production of sirohaem and cobalamin, and compare and contrast the biochemical properties of the enzymes involved in these biosynthetic pathways. Furthermore, we describe a novel pathway used by Desulfovibrio to synthesize haem b, which provides a previously unrecognized link between haem, sirohaem, and haem d(1). Finally, the organization and regulation of genes involved in the tetrapyrrole biosynthetic pathway is discussed.